Mark Doss, a supervising lawyer at the International Refugee Assistance Project, pulled an all-nighter on Jan 27, 2017, and his work life has not been the same since. On that day two years ago, his client Hameed Darweesh, an Iraqi who had worked primarily as an interpreter on behalf of the United States government for 10 years, was the first person detained at Kennedy Airport under President Donald Trump’s executive order barring immigrants from seven predominantly Muslim countries, including Iraq. Images of immigration lawyers huddled together over laptops on airport floors across the country made global news. Nineteen hours and a habeas corpus petition titled Darweesh vs Trump later, Darweesh was the first detainee to be released. Doss was able to comfort his weeping client at baggage claim. When you’re an immigrant to the United States, you come to rely on a selection of people you never expected to need as guides. The co-worker who explains that aluminium is both spelt and pronounced incorrectly here, the waitress who advises against ordering that second cold brew and, crucially, the immigration lawyer who can push open the door to a new life, a whole country. I moved here five years ago in a relatively straightforward way, but one that still involved much paperwork, expense and anxiety. Amanda Gupta, who specialises in visas for artists and entertainers, was my lawyer. It’s because of her I get to live my own peculiar American dream, which is to have a comedy career and drink as a much cold brew as I can before my heart explodes. That first travel ban and each subsequent one made my stomach lurch, as I imagine not being allowed back into the place I belong. 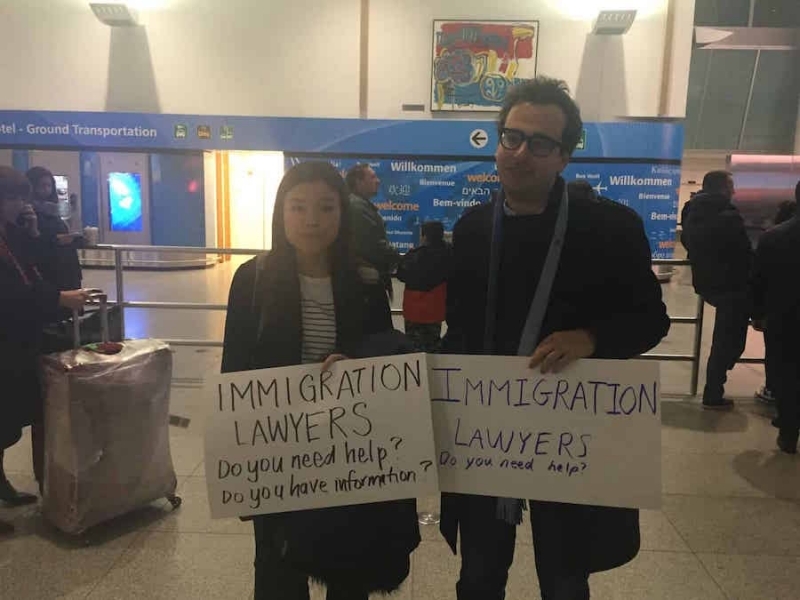 And since that chaotic weekend two years ago, I have wondered what life has been like for immigration lawyers — people whose livelihoods depend on getting others through a door that was only ever ajar and is now in danger of slamming shut. As the administration hacks away at immigrants’ rights and rains down policy changes, immigration requests that would usually have been approved are denied, many lawyers told me. They are receiving requests for further evidence that are baffling, with precedents continuously blurring. “Any way the government can have a moment of ‘gotcha’ they do and they will,” Gupta said. “If they can get you out of the country, they will.” John Khosravi, an immigration lawyer in Los Angeles, agrees. “These past two years it’s like someone is running around sticking their finger in people’s eyes and I’m an eye doctor,” he said. “Sure, business is good, but those aren’t the injuries I want to treat.” On his podcast “The Immigration Lawyers Podcast,” he urges his colleagues to have a Plan B and to save their money for a rainy day. Khosravi is Iranian-American, and when he started practising nearly a decade ago, all of his clients were Iranian. Since then, he has diversified and now has clients from around the world. “Had I just been starting out when the ban came down, that would have been lights out, just no way,” he said.